1.1.1. Goals: To ensure that all students receive a comprehensive education. While developing skills that help them in both higher education and real-life situations, Woking with my students to improve the ability to come up with questions and be able to answer them using logic, critical thinking, and research, ensuring that students are more prepared to think on their own and to question what is being told to them. 2.1.1. Education is the foundation of a functioning society. However, education is not only what one learns in the classroom. Education is the building blocks in which guilds learning. Education is not limited to what is taught solely in the classroom but is also influenced by the factors sounding individual students. Education is the guild to help create a function and well-working society. 2.2.1. Teachers are there to guild students in both education of curriculum and education in their real life. Their role is to teach students both what society is believed is necessary to learn. While incorporating real-world examples to help students receive a well-rounded education, that is not limited to the curriculum. 2.3.1. Student are the vessel in which education is received. Students are not limited to school age to college. But anyone who has a natural curiosity to learn. Their role is to both learn what society believes they should know; but, also question what is going on around them. Trying to solve the problems that they have been faced with. 3.1.1. Belifes on how Adolecent Learn: Adolescents are at a time where they are still curious about the world around them. They want to solve the world around them and find out how it works on their terms, not by having it spoon fed to them how it works. I believe that they should learn from self-interest, group work, and teacher assistance, but not spoon feeding them lecture notes. But actually to read, think, and question what they are learning. 3.1.2. Adolescents are special because they are still curious about the world. But now they can come up with questions about what they are learning, and find ways to answer them. I want to teach adolescents; because I want to help guide them in their curiosity. Showing them ways to research, solve, and to think critically about the world around them. And how what the History of the past has created in the modern world. Helping them to understand through their questions why we do things a certain way, because of how history has set it up to be that way. 4.1. Curriculum- The curriculum will be mostly driven from what the standards are for the subject. As much as I believe that students should be learning through questions, there are still many things that students need to learn to be functioning members of society. 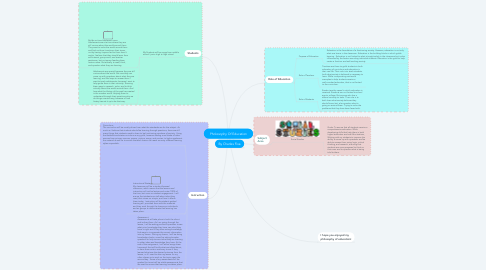 Using the textbook and state curriculum as my guild; however adding a multitude of other sources from primary sources, poems, picture, songs, and movies, to help supplement the material as well as to ensure that each lesson can reach as many different learning styles as possible. 4.2. Instructional Strategy: My classroom will be a student-focused classroom, which means that the lessons and instruction will not be lecture and notes 100% of the time, but more on student engagement. I will ensure that students can talk about what they read, their views on a topic, and how it affects them today. Instruction will be student guided learning as I provided them with the materials and they work through the lessons as individuals and as groups to demonstrate that learning has taken place. 4.3. Assessment Assessments will take place in both the direct and indirect form. As I am going through the lesson, I will be asking pre-work questions to see what prior knowledge they have, see what they know is right and if they have wrong knowledge, find ways to incorporate the correct information into my lesson. During my lesson, I will be doing knowledge checks, as well as asking broader questions to help connect what they are learning to other ideas and knowledge they have. At the end of the assignment, I will either assign them homework that will fortify what we talked about, or have them write a summary to see if they learned what was the desired outcome from the lesson, or if I need to alter my lesson for my other classes or to work on the topic again the second day. Some of my assessments will be graded, but most will be subtle assessments that are used to ensure that learning has taken place. 6. I hope you enjoyed my philosophy of education!